Dianese Gulf starts from the beach and reaches the mountains in a few km. It has seven main villages: Diano Marina, San Bartolomeo al Mare, Cervo, Diano Castello, Diano San Pietro, Villa Faraldi, Diano Arentino. Each one has a different identity. 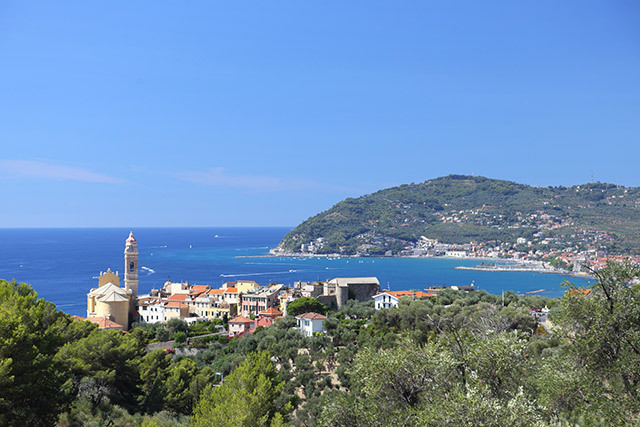 In San Bartolomeo al Mare, within five minutes walk from the hotel, is worth visiting the Sanctuary of the Madonna della Rovere, one of the oldest religious temples in Liguria, built on the ruins of a Roman settlement. 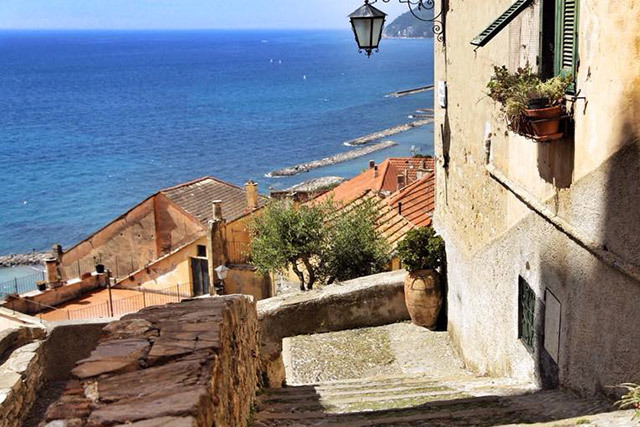 The medieval village of Cervo, one of the most beautiful towns in Italy, is a half hour walk. Perched on a hill overlooking the sea, Cervo, with its many craftsman shops, offers unbelievable glimpses between the ancient buildings and olive trees. Remember to visit the Ethnographic Museum of Western Liguria in Piazza Castello. Cervo hosts the prestigious Festival Internazionale di Musica da Camera. Near Diano Marina, you can visit Diano Castello, ancient and fortified village of the tenth century. Continuing the journey in the surrounding valleys, overlooked by the Pizzo d’Evigno (989 m), you will pass through many unique villages. Within a few miles the panorama spans from olive trees to forests until the pastures, with sea view. Throughout the hinterland you will admire a huge feat of engineering: the terraces of dry stone cover almost all the hills. The Caselle (constructions similar to the Sardinian Nuraghe and the Trulli of Puglia) and the anti-barbarian towers scattered in the valleys testify a past of wars and hard work, both on the sea and on the mountains. Now, grab your camera and take a walk in our land. There’s still a lot to be discovered! 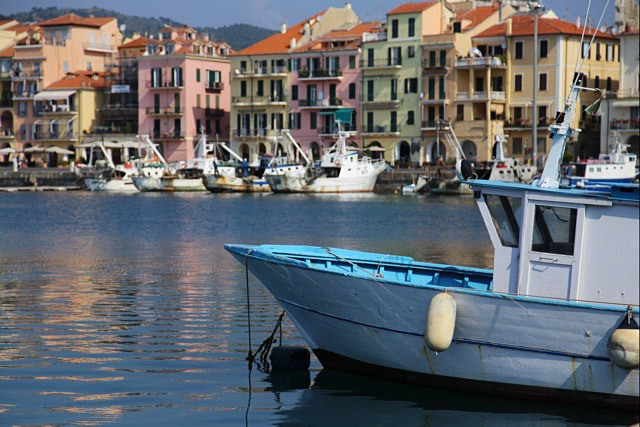 Within a quarter of an hour drive, Imperia, a city once divided into Oneglia and Porto Maurizio. 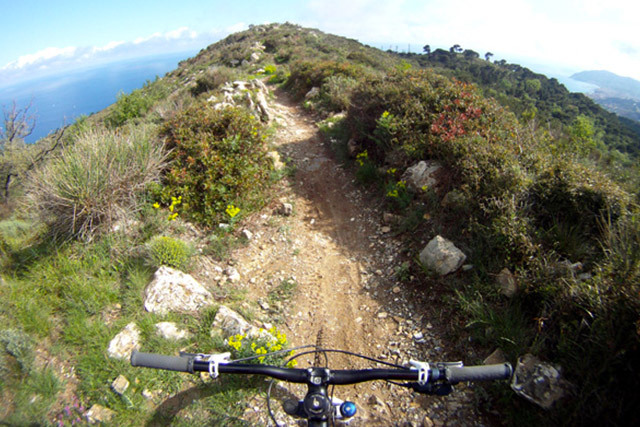 You can even reach the town from Diano Marina by a pedestrian road, called “incompiuta”, near the sea. In Imperia, shopping continues under the arcades and inside the Galleria degli Orti, taking a lunch at the restaurants in Calata Cuneo and enjoying the view of Parasio from Porto Maurizio’s port. 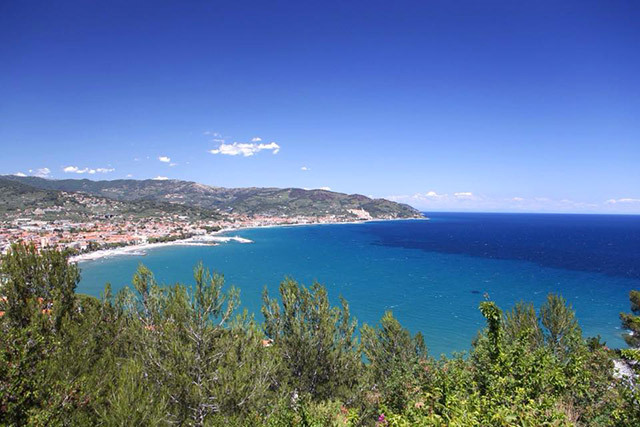 Imperia, reachable by walking or by city bike through the walkway by the sea, has its main attractions in the ancient port of Calata Cuneo, the Olive Museum, Villa Grock and Parasio with its spectacular Santa Clara lodges. With a twenty minutes drive you could reach the fashionable shops of the famous Alassio and Sanremo, the malls of Arma di Taggia and Imperia. Ride the highway for 45 minutes and you will take an exciting bath at the aquatic park Le Caravelle in Ceriale. These are just a few examples: to find out more, ask the front desk. You can’t miss the elegance of Sanremo Casino, not far from the Teatro Ariston where the Festival della Canzone Italiana is held every year. 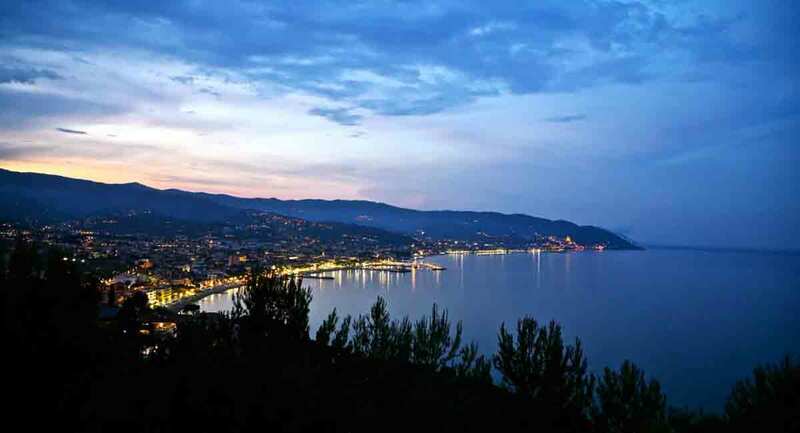 Near the beautiful village of Laigueglia you will find La Suerte, an impressive open air disco by the sea. 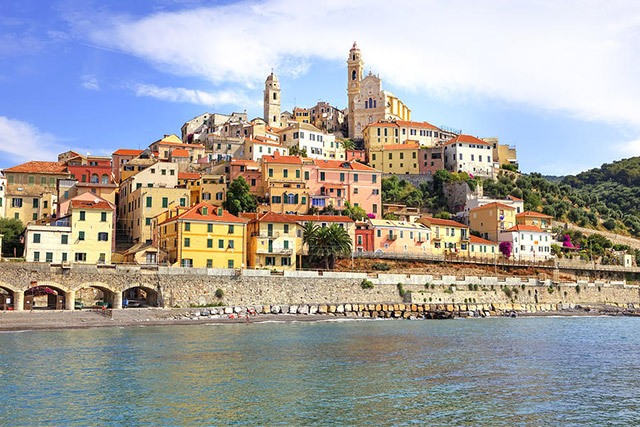 Other unforgettable destinations are the villages of Apricale, Bajardo, Ceriana, Dolceacqua, Seborga and Valloria (with its painted doors), the old town of Taggia and the rich villas of Sanremo (like Nobel’s one). Another major attraction, in the province of Savona, a 30-minute drive from the Hotel, are the exciting natural Caves of Toirano. For a trip in the unusual, be sure to check Bussana Vecchia, destroyed by the main 1887 earthquake and resurrected thanks to dozens of artists who have settled there, opening workshops and creating works of art between the ancient ruins. 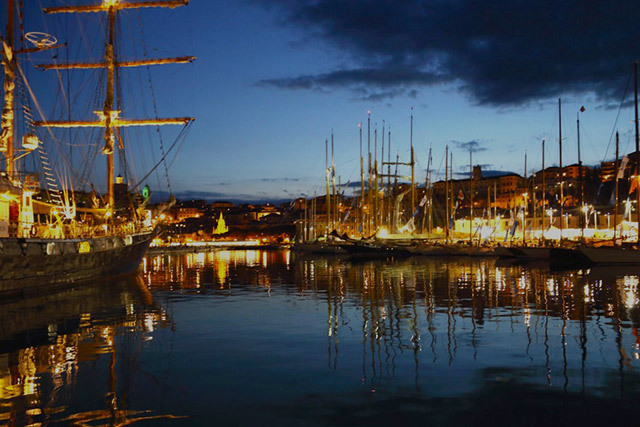 We remind you that San Bartolomeo al Mare is less than an hour drive from the Côte d’Azur: Monaco can be reached in 40 minutes and you could spend an unforgettable night in the French nightlife. 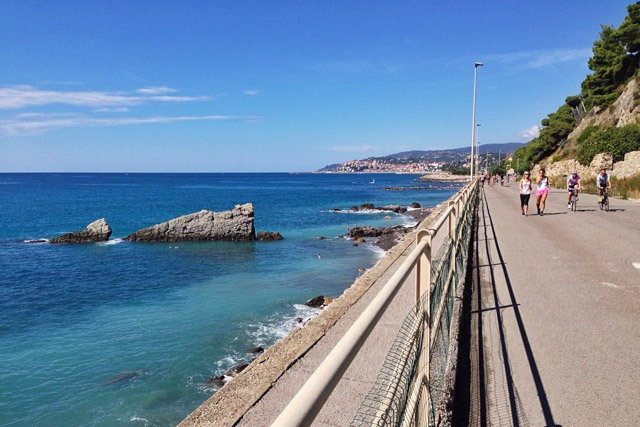 San Bartolomeo al Mare is one hour drive from Genoa’s acquarium (the largest in Italy) and sixty kilometers from the prehistoric site of Balzi Rossi or the famous gardens of Villa Hanbury. Among the various local products, some should really be mentioned due to their importance gathered nationwide and, sometimes, worldwide: beans from Conio, Pigna and Badalucco, Garlic from Vessalico, Perinaldo’s artichoke, the small pumpkin called “trumpet” and, of course, the extra virgin olive oil, of which our family is a certified organic producer. The DOC wines of the province are: Vermentino, Pigato, Ormeasco and Rossese di Dolceacqua. White and red wines, connecting the sea to the mountains. You’ll find the wines in our restaurant. Among the recipes: Farinata (made with chickpea flour), Sardenaira (a tick, soft and crisp pizza), stockfish, Piscialandrea (similar to the Sardenaira), Torta Verde (a vegetable stuffed cake), Panissa (again with chickpea flour), Canestrelli di Taggia (salty and tasty biscuits), Cima (stuffed meat, served sliced with a green sauce), Pesto, Cubaite (ancient cookie made with wafers, honey, chestnuts, nuts…), Condiglione (the local salad), stuffed vegetables and the rustic bread from Triora. Come to the Hotel’s desk and ask for details!